Around 10:30 this morning, six shots were fired on the 900 block of Buena, in what police are telling neighbors was a gang-related shooting. A 22-year-old man was shot in the chest on the block between Sheridan and Broadway. As of 11:45, we are getting reports that the street is blocked off, the police are picking up bullet casings, and media are present. The man was taken to Illinois Masonic and is undergoing surgery for his injuries, which are very critical. According to the Crime In Wrigleyville blog, "Investigators believe that images of the offenders were captured on a Chicago police pod camera. 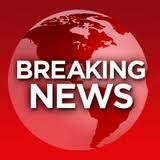 A covert Chicago police vehicle in the area also saw the suspected offenders running from the scene, a source said." Update: The Sun-Times has the story up. Update: Ald Cappleman released a statement. "According to the Chicago Police Department, at approximately 10:30am today, there was young man shot on the 900 block of West Buena Avenue. The victim was approached by two offenders and was shot in the chest. Police say he was taken immediately to Illinois Masonic Hospital where he is undergoing surgery and remains in critical condition. Chicago Police detectives are working with neighbors and nearby witnesses to try and gather accounts and surveillance footage. Police have stated that the victim was most likely known and targeted by the shooter. If you have any information regarding this incident, please call the 19th Police District CAPS office at 312-744-0064. I invite you to attend the public safety meeting this Thursday, April 7th at 6:30PM at the The Shift at 4101 N. Broadway. I encourage you to attend to be a part of the discussion surrounding this incident and overall safety in our neighborhood. I will continue to work with police and neighbors to do everything we can to keep our streets safe. We need your help in continuing to improve public safety in our community." Thank goodness there was surveillance cams. This took place right in front of our Buena Public Library. I saw the police responding and blocking off the road as I drove by. Did not see the shooters. Think of the tax payer dollars being expended to give the gang related victim the best of care at Illinois Masonic, the North Side's top trauma center. Think what that money could accomplish for the health of so many if it were not necessarily diverted to care for gang war casualties. I received a call from the library this morning that Book Babies was cancelled this morning because there was "just a shooting at the corner". I shudder to think what could have happened if my son and the nanny had decided to go to the library early. This is not ok and one of the many reasons we are moving out of this neighborhood later this month. We have lived in Uptown for 4 years but have not seen much improvement, in fact the 'towns' under the viaducts have only gotten worse. This is not a neighborhood I feel comfortable walking around by myself, much less with my infant child! I have lived in this neighborhood for more than 21 years, and more than 18 right across the street from the library, and I have never witnessed or need a victim of crime in Buena Park. I am not in favor of the tent cities, but I haven't heard of them being crime sites for those who don't live in them. You are certainly free to move to any place that will have you, but I doubt you will escape random criminal acts such as this one, not in the U.S. anyway. Another gang shooting.... And once again, we have to say thank God no innocent lives were taken, and that the attackers had good aim. This is really out of hand. Remove these people from our streets, our city, our state! Wow. Who lives on that block? I'll bet he's pissed. This is the second shooting on this block in less than 6 mos i believe. On the other side of buena, across Broadway, there was a gang related shooting in November. I don't want to move, but my home is right between these spots. What can we do? The jerks responsible for this violence don't care about others, so to h3ll with them. And for those who immediately pull the race card and protect them... A pox on the house of your failed social experiment!!!!! This -like most things- is really about all about Money and Power. In this case, the fight over hundreds of millions of dollars in real estate portfolios. And the Money and Power they want. So spare me all that musty old drug addled '60s idealism please. It's despicable...If not outright criminal. It was also within a block of the Catholic elementary school at St Mary's of the Lake and a day care center up the block. Let's hope that gets the shooters into mandatory harder sentences for having guns in a school zone. That is, if they are every caught. There was a similar type of shooting just about a year ago 10 feet from our home entrance at 1 p.m. During which time my wife and two children were home. I thank god they were all safe but that's all it. Took to flee the city, after 38 years in Chicago and Uptown we went to the burbs. We still own our u it and rent it out so we keep tabs, hoping to one day move back to a better Uptown. The victim died at the scene - what a waste. Shootings in Uptown are a sadly too frequent occurrence. Shootings in Buena Park or outside the band that runs from Montrose to Wilson and the lake to Malden are much less frequent. I've been in Uptown for 30 years and am old, crotchety, and have a good memory. I don't blame Nathan for not wanting to raise kids in that band, but outside that area gunplay is relatively rare. Buena Park typically gets 0-3 shootings a year and they tend to be around Irving and Clarendon/Broadway where some despicable bangers of the hispanic variety live and hang out. I've been here long enough to remember idiot white gangs like the Almighty Gaylords who dominated Sheridan Park for a while in the 70's thru early 90's. I'm so old I remember buying my first buffalo hide from Hewhospeakswithforkedtongue Littleton back when Uptown was merely a swamp. Or maybe not. In the last ten years there have probably been 200 people shot in Uptown. According to the defunct Red Eye homicide tracker 41 people were murdered in Uptown from 2006 thru 2015. Look at the map and read the accompanying stories. Most of the dead were bangers or associating with bangers. There are exceptions to that. There are 3-4 people there who were merely bystanders. There are also a number who were killed in domestic type situations. The truth is if you're not a banger or hanging with a banger you probably have a better likelihood of getting seriously injured or killed in an auto accident than you do in some Uptown shooting. Those of you who move to distant transit unfriendly suburbia are subjecting your children to a similar rate of death from car accidents as kids in some of the worst neighborhoods in Chicago face from gunfire. That sounds like BS, but it ain't. That being said I can understand how the lesser likelihood of violence or being victimized is appealing. The psychological damage from neighborhood violence is real. 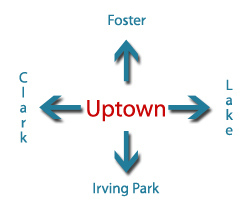 My suggestion to those of you who can't deal with the level of violence in Uptown is to move because while it can be reduced and has its ups and downs it's not going to disappear anytime soon. Preckwinkle and Dart seemed determined to reduce the number of people in county jail. You can be convicted in this state for purposefully shooting someone and be out and about to shoot again in fewer years than you have fingers on one hand. "My suggestion to those of you who can't deal with the level of violence in Uptown is to move because while it can be reduced and has its ups and downs it's not going to disappear anytime soon." Nope. Not buying that argument Irish. Those of us in Uptown should -NOT- have to accept random gunfire from thugs as part of the fabric of the neighborhood. Why are these thugs being allowed to live openly in tax supported housing? WHILE MY TAXES ARE SPIRALING UP????? Deny them their sanctuary, and their banging will come to an abrupt end. They can pay their own way. Why do we see this guy in Voice of the People housing? IrishPirate, do you remember the Wooden Nickle bar? Uptown has a long history of rough & tumble taverns that lead to vagrancy. Of course, this leads to more serious violence. I see americanlt is still doing his years long performance art. I'm planning on heading to the arcade bar tonight for some PacMan and alcoholic beverages. Need to pick up a package at the post office anyway and going right before they close is the least annoying bet. Now since the weather is lousy and I can't bike on the lakefront I will take Sid's bait. He does so enjoy it when someone bites. Yes the bangers should be removed from any publicly assisted housing. Easier said than done. Legal and political obstacles abound. I seem to recall someone in the VOP food chain supporting the wannabee dauphin of Uptown, Amy Crawford, last election cycle. Like jock itch she'll be back in 2019 or 2023. If she were more astute, different than IQ, she would have decamped for the center of the 47th Ward and run there in the wide open 2019 race. With her impressive background she'd have a shot there. I've said it before we'd be better off spending money on more city attorneys to work on banger evictions than cops. Good luck getting that done. To paraphrase Lincoln talking about General Rosecrans "Rahm is like a duck that's been hit in the head". He can't even pick a police Chief not mired in scandal. Rahm is focused on the minutiae and missing the big picture. He should have pushed for higher taxes in 2011. He should have pushed for more lawyers working on gang stuff and more cops in 2011. He should never have gotten into bed with Rauner whose idea of leadership is burning down the state to save it. Rahm is an a-hole of epic proportions, but at heart he is a political animal. Rauner is a sociopath who would eat our brains with fava beans if he could get away with it. Rahm needs to be focused on more long term big picture stuff like Bloomberg did in NYC and less on winning the PR battle every day. "Yes the bangers should be removed from any publicly assisted housing. Easier said than done. Legal and political obstacles abound." Weak answer Irish. Why are the operators of thses properties, like Voice of the People, given a pass about being responsible landlords? As a resident of Uptown, I find the excuses and subsequent shoulder shrugs inexcusable. Its time to hold the operators of these properties accountable for their tenants. If the fail in that duty, we as taxpayers need to find new operators. "If they fail in that duty, we as taxpayers need to find new operators." How are you liking the new 'banger lodge at the Snack 4 Less Irish? Agreed Sid--I said before and will continue--remove the safe haven section 8 housing. Remove their homes and punish their families for harboring them while we continue to give them free housing, food, education etc. I think its well past time for a RICO investigation of Woodlan Development Voice of the People and the CHA for their many years long pattern of allowing the open criminal use of thier properties. Here is a statistic that would be interesting. What percentage of shootings have occurred within 50 feet of a subsidized housing property operated by one of the three entities above in the last eight years? in Uptown and Rogers Park? Perhaps another. 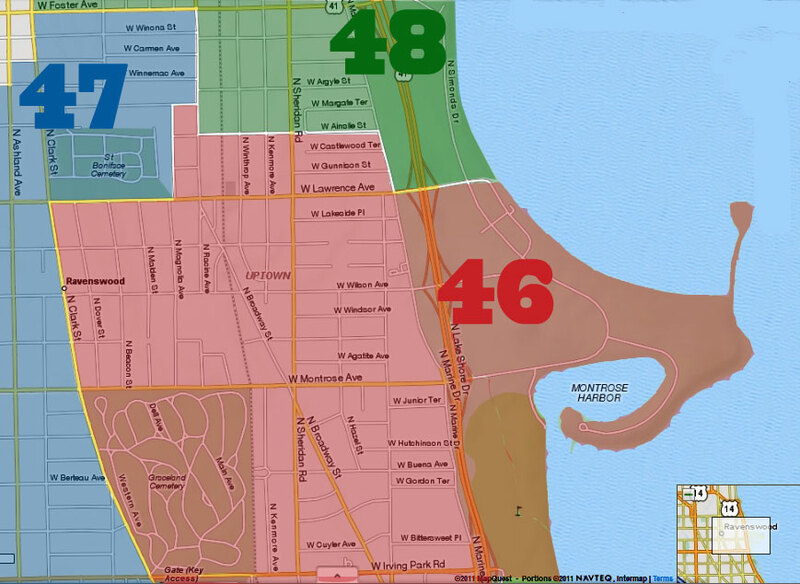 What percentage of shooting victims in Uptown and Rogers Park list their address at a subsidized housing property? Yep. I still don't understand how the Woodlawn Organization ended up as a manager of CHA scattered housing. If you study your gang history, you will find that the BLack P Stones formed within the Woodlawn Organization. T.W.O. even stored guns for them in the federally funded youth center that functioned as Black P Stone headquarters. So, In Uptown, no one could get the Black Gangster Disciples out of our scattered site housing for years, and years, and years. Then along comes the new management, T.W.O. i.e. The Woodlawn Organization, and the Black Gangster Disciples go bye-bye and the Black P Stones move in and become the new major gang in Uptown living on the taxpayers dime. How about that? But, as part of what The Woodlawn Organization co-founder Bishop Arthur Brazier dubbed "a revolution of rising expectations," Finney instead helped beat back plans by the U. of C. to tear down those buildings and expand its campus south into Woodlawn. The organization also chased out local grocers who price-gouged their African-American customers and, for a brief period, convinced the Blackstone Rangers gang to contribute toward neighborhood improvements. That effort dissolved in 1972, when four of the gang's leaders were found guilty of using $1 million in federal grants for a phony job training program.